The PBS Frontline Special Generation Like takes a deep look into how an up-and-coming group of tech-savy kids are becoming both creators and consumers of a new digital culture. Through popular social media outlets like Twitter, Facebook, YouTube, Instagram, and Tumblr, today’s teens are redefining traditional marketing and public relations techniques by identifying and expressing themselves in a digital settings. Likes. Views. Hits. Friends. Subscribers. Tweets. Favorites. The short documentary makes it clear we are living in an era where every move we make is projected into the public sphere and quantified by a certain set of numbers. Narrated by media theorist Douglas Rushkoff, the hour-long special interviews several well-known personalities who have struck it big through social media. Tyler Oakley is one such case. The 25 year-old blogger has over 4.5 million subscribers on his Youtube channel and 2.5 million twitter followers. He started vlogging from his parent’s house back in 2007, back when Youtube was still in its infancy. Like a typical teenager, he talked about his favorite clothes, his favorite music (One Direction), favorite movies, food and products. As his online popularity increased, the major brands he was mentioning started paying attention. It wasn’t long before brands like Pepsi, People Magazine, Nike, and Taco Bell started sponsoring certain videos, setting up Tyler with exclusive gifts and parties, and creating an image and brand loyalty among some of Tyler’s fans. It becomes apparent in the social media realm that one’s online presence means everything giving life to the phrase “you are what you like”. By the simple act of “liking” certain brands on Facebook, you are actually playing a part in a bigger community, as well as submitting your tastes to be analyzed by mega corporations. When brands figure out how to tap into your personal tastes, likes, and interests, the line between consumer, product, marketer and creator become blurred. The documentary gives several examples of how modern companies are utilizing fans as mini-employees – getting teens to promote their products among their peers in exchange for exclusive content. The documentary keeps things at a pretty brisk pace, highlighting both the pros and cons that come with this unprecedented technology. 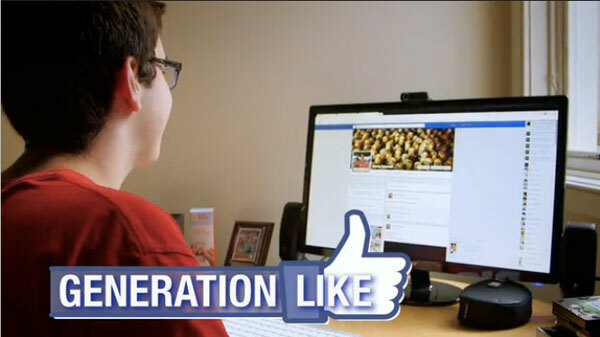 Though the tone of the film as a whole leans towards the critical/cynical side of online commercialism, Generation Like is mostly an engaging and interesting watch for all ages, and should provide for some deep discussion about the role of digital media within corporate culture.